when i picked this tshirt up in zara my friend gave me that raised eyebrow look of ‘really? why you doing that?’ but i love it. 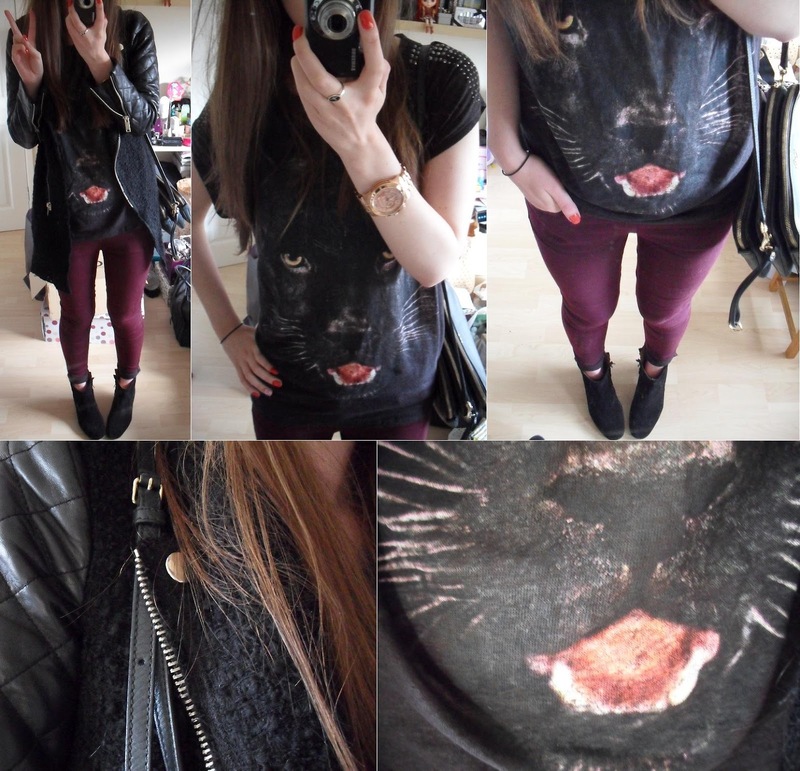 who doesn’t want a panther on their top and if i can’t have any christopher kane monkey tee or the givenchy rottweiler version, then this one will have to do. do you know people are selling this coat for over £250 on ebay? mental. i couldn’t sell mine though, as a biker style coat addict, it’s too perfect. that seems to be a running theme with zara, people buy them and try to sell them on for a ridiculously inflated price. does anyone actually buy them? i’d very much like to meet someone who does and spend a good 10minutes slowly shaking my head at them. i was officially rained on when i went to pick my niece up from school. she goes to quite a posh place, where all the mothers think they’re above you and relish in the opportunity to look down their noses. i’m not going to say i don’t care completely what they’d think of me, as i believe that’s quite a flippant attitude to have, i just don’t care enough. i think having that snobby attitude must make you such a boring person to know, too, so no wonder they all group together in their dull little clique. anyways, to make matters worse, apart from the rain and the awful parents, the man in the post office thought i was my niece’s mother! sigh. apparently some person on the bus thought i was my sister’s baby once when she was 14. 14! how young do people have children these days and other such grandparent statements. ps. how do we feel about me doing some beauty posts? either stand alone mini reviews of several things or tagged on the end of an outfit post? please let me know! Previous Post today: nephews birthday and my giveaway winner!